This has been a good year for volatility. If you like that kind of stuff, that is. It’s not that volatility has reached stratospheric levels; it’s just that it’s returned to a normal level. It wasn’t too long ago—think November—that the Cboe Volatility Index (CBOE: VIX) scraped a historic bottom at 9.14 percent. February changed all that. VIX spiked over 37 percent as the S&P 500 was trimmed by 4 percent on the first Monday of the month. Compared to VIX’s 2008 high near 81 percent, February’s run-up doesn’t seem like such a big deal until you look at volatility immediately preceding the market break. In the year leading up to the spike, VIX averaged just over 11 percent, significantly less than its historic mean of 18.52 percent. Well, take a gander at the chart below. VIX—depicted by the black line—dropped off precipitously from February’s level and is now bouncing around the 20 percent level. It seems volatility has, more or less, reverted to its mean. There’s evidence that recent market action is changing investor’s appetite for risk. You’ll see this represented by the red line in the chart. 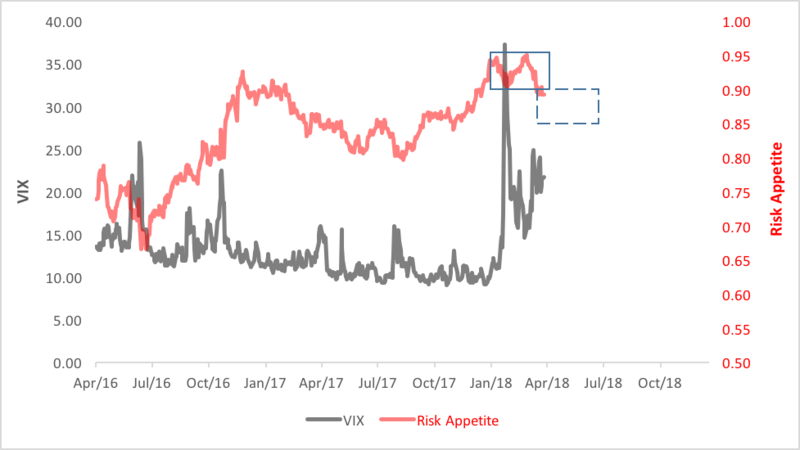 Risk appetite here is derived from the price ratio of the PowerShares S&P 500 High Beta ETF (NYSE Arca: SPHB) over its sibling PowerShares S&P 500 Low Volatility ETF (NYSE Arca: SPLV). There’s a double top in the ratio bracketing the February VIX spike which makes a technical case for further deterioration in investors’ enthusiasm for high-beta stocks. So, what does that mean? Simply put, a slump. For the S&P 500, now churning around the 2,650 level, a downside objective of 2,333—a 12 percent drop— is hoving into view. Is that enough to worry you? If not, consider the chart depicting the real-time level of investor confidence. When you put the price of the Consumer Discretionary Select Sector SPDR (NYSE Arca: XLY) in ratio to that of the Consumer Staples Select Sector SPDR (NYSE Arca: XLP), you can gauge how flush consumers—and, by extension,investors—feel. We last looked at the XLY/XLP ratio in our Feb. 12 column. Have Stocks Become Less Risky?